Easter. It’s the most popular time of the year for family adventures. We spoke with a bunch of travelling families to find out where they’re heading… and where they hide the eggs! It’s Easter time, so I asked a number of travellers what they were doing for the holiday. And, of course, the really hard questions, like how to keep the Easter Bunny secret in a caravan and where to hide the Easter eggs. The Sutic family, aka Sutic’s Great AdVanture. Jayson, Racheal, Tilly (4) and Mia (2) spent last Easter in their brand new home that they had just built. They spoilt the girls with an Easter egg hunt in the morning and spent dinner with their family. This year, Easter is a little different, with no real plans, other than being somewhere in the bottom half of Wetern Australia, celebrating their first Easter on the road. How do you keep the Easter Bunny a secret in your van? Where do you hide the Easter eggs, or do the kids get something else? Allan, Emma, Dominic and Indii of My Rig Adventures are heading to Rover Park, NSW, for Easter. Allan, Emma, Dominic and Indii spent Easter last year in their home town, hanging out with family and the kids taking part in an Easter egg hunt with their cousins. This year, the kids will be taking part in another Easter egg hunt, but this time with new friends and families at Rover Park in New South Wales. There is going to be waterslides and 4WD adventures to ensure everyone has a great time. Where do you hide the Easter eggs? Eliana of The Wandering Steels. Ash, Jaz, Denzel (9) and Eliana (5) have been on the road for over two years, with the family often stopping so Jaz can work as a nurse. Last year, the family spent Easter in Tasmania, where they met up with friends of friends. These new-found friends took them to a magnificent lake, at a hidden location, with their water skiing club. While the lake was freezing, they did spend some time on the water and the experience is one they will forever treasure. This year, the family are off to Cape Le Grand for five days with another travelling family they met last year at Carinya Station near Lightning Ridge, NSW, and Jaz’s mum is flying up to camp with them as well. Stacey and Wayne in Mount Gamier, SA. Stacey and Wayne have just gotten married, and are due to hit the road full time in May. Last year, they spent Easter camping in Mount Gambier, SA, exploring the sink holes, the caves and of course the incredible Blue Lake. Stacey and Wayne also hire out camper trailers, and this year they have both rented to families who are looking for a camping experience, while Stacey and Wayne stay home chilling and sorting themselves out for their epic road trip. They are also going to top-up the kitty by attending market stalls in the Grampians, Vic. Rory, Jayme, Aston, Emielia, and Edie of These Wander Days. 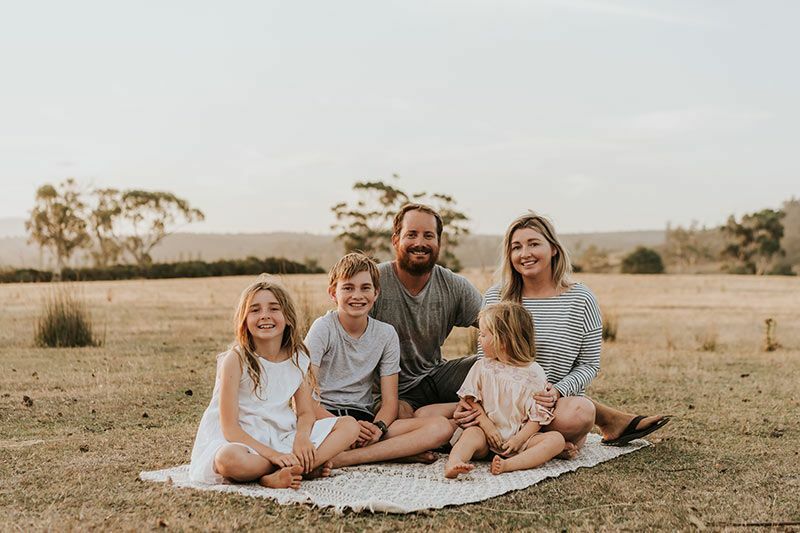 Rory, Jayme, Aston (12), Emielia (8) and Edie (3) spent last Easter at home on the Sunshine Coast, oblivious to the fact that they would have made the decision to travel the country and be spending Easter this year in a caravan. Easter at home would involve the kids following a trail of eggs to a basket for each of them that had a chocolate bunny, new PJs and a couple of books. But this year, not knowing where they will be, they are determined to create some magic for the kids. Liam Millward is a teenager on the road with his family. He has become a passionate RVer and is the driving force behind Four Hands in a Tin Can. Liam is educated through NSW Distance Education. He likes a yarn and has made many friends during his travels. GoRV is the country's premier recreational vehicle media group. Run by Australia's most experienced RV content producers and media specialists, GoRV is the best destination for credible tests of new caravans, motorhomes and camper trailers, with features on amazing touring destinations and tips and advice to make your next trip your best one yet. © GoRV Media Group. All Rights Reserved. Website built with ♥ by Cameron Damon Media.